A dazzling new series debuts with a remarkable heroine certain to become a new icon of suspense, propelled by the singular narrative genius of #1 New York Times bestselling author Dean Koontz. "I very much need to be dead." These are the chilling words left behind by a man who had everything to live for-but took his own life. In the void that remains stands his widow, Jane, surrounded by questions destined to go unanswered . . . unless she does what all the grief, fear, confusion, and fury inside of her demand: find the truth, no matter what. There is no one else to speak for Jane's husband-or the others who have followed him into death at their own hands. Although people of talent and accomplishment, people admired and happy and sound of mind, have recently been committing suicide in surprising numbers, no one else is willing to give up everything, just to seek, to find, to know. No one except Jane. But ahead lies only risk. Because those arrayed against her are legion . . . and dangerously devoted to protecting something profoundly important-or terrifying-enough to exterminate any and all in their way. Too many have already died, and those responsible will learn that all their malevolent power may not be enough to stop a woman as clever as they are cold-blooded, as relentless as they are ruthless-and who is driven by a righteous rage they can never comprehend. Because it is born of love. This reminds me of another Dean Koontz novel. False memory. which also deals with mind control. But this is a brilliant and scary look into what scientists can do of they wanted. Jane Hawk is a a brilliant and strong woman and the bad guys biggest mistake was thretening a mother with Her child. VERY BAD MOVE! If you like Dean Koontz you will like this! Give it a listen and Elisabeth Rodgers reading is great. the "bad barbie" line really tickled me! A good book, probably better as a fast paced movie than a 14hr audio book. However no meaningful conclusion and like many of his books, seems to be made up as it goes along. 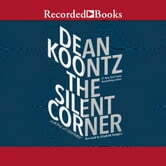 This was my first Dean Koontz book and certainly wont be the last. I loved the character Jane Hawke, who is attractive, yet very smart rogue FBI agent. This is a fascinating story of the possibilities of our minds and the control one can have over another. Deadly if controlled by the wrong people. I would definitely recommend The Silent Corner and can't wait to start the second Jane Hawke book in the series. Really enjoyed this book, was exciting right from the get go. The narrator was excellent and kept me totally interested. Full marks in every way.